We already know your arms are AWESOME. Your arms are for embracing your loved ones, celebrating with friends, lifting children, groceries, boxes, and they DO so much for you. What if there was a workout program designed to train your upper body in a way that challenged you and guided you to build fabulous and functional muscles? AWESOME ARMS is all about adding muscle definition to your arms and upper body to help you do the things you love with more strength, more stamina AND more wow factor. A 12 week, online resistance training program designed to increase your strength and train your muscles for more definition. With a workout plan that focuses on BUILDING MUSCLE and DOING SOMETHING DIFFERENT, you can feel strong and capable again. A program that focuses on encouraging you to own and cultivate your strength, is what AWESOME ARMS is all about. I’m Lana Osborne-Paradis, personal trainer and creator of the Awesome Arms program. 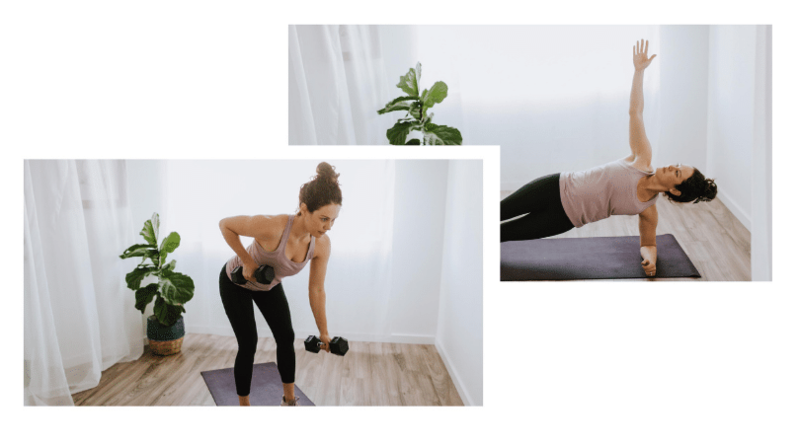 I’ve worked in the fitness industry for over 15 years and have a deep love for teaching women how to lift weights effectively and efficiently to realize their muscle definition goals. 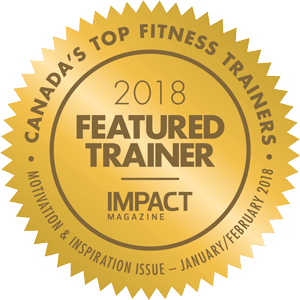 Training women to build inner and outer strength is my passion, which is why I have a degree in Exercise Science and multiple post-graduate certifications to my name. 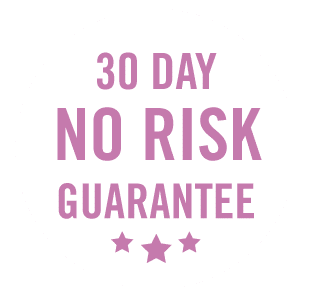 My GOAL is to help women feel FIT and CONFIDENT on their health and fitness journey, and I’ve helped hundreds of women overcome busy schedules, self-doubt and old narratives to craft the body and mind of their dreams. I love that there are two intensity levels with each exercise in this program. I find myself doing mostly progressive option throughout the workouts but am able to switch to basic if I need to. Between the different levels and the ability to increase weight I think this program would be great for all levels. I love working my upper body without spending too much time, so this is perfect! Is the AWESOME ARMS program for me? People who want to build amazing muscle definition in their upper body. New exercisers who are learning how to lift weights and want basic, effective options. Experienced exercisers looking for a challenging, safe and efficient program. People who want to see results from their training in less than 30 minutes per workout. Those who want to work out at home with limited equipment, or those with access to a commercial gym. People who want to try a different approach to resistance training to maximize their results. 12 WEEK STRENGTH TRAINING PROGRAM designed for minimal equipment. Do it from home or your office gym in under 30 minutes per workout, 3 times per week. BASIC AND PROGRESSIVE options for every exercise on every workout. Choose exercises to fit your current level of training. 12 WEEK CALENDAR to guide you on how to execute the program including rest days. 12 PRINTABLE PDF WORKOUT SHEETS with links to coaching videos of every basic and progressive exercise option. 3 DIFFERENT STYLES OF STRENGTH WORKOUTS to challenge your body. Cycle through monster circuits, targeted overload training and accelerated supersets each week to get better results. BONUS!!! IN-DEPTH COACHING TUTORIALS to guide you through proper breathing, alignment, push-up mechanics and more. BONUS!!! 3 FOLLOW ALONG MOBILITY FLOWS to improve flexibility, facilitate relaxation and promote active recovery. do something different to create different results! Are you ready to BUILD amazing muscles, FOCUS your training goals, and ADAPT your strength for your life today? 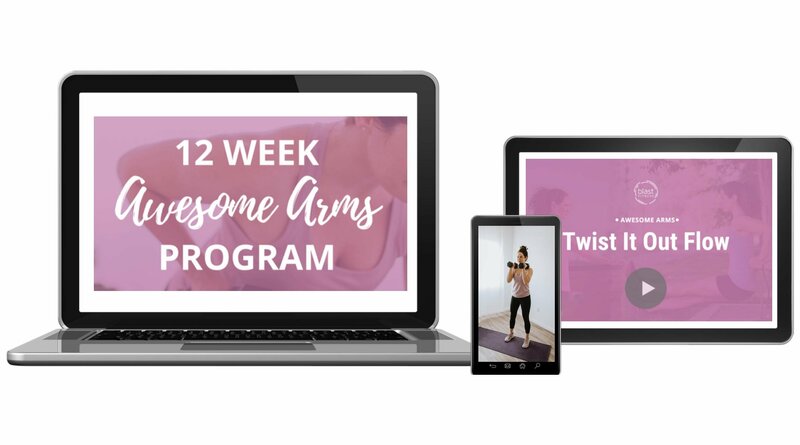 Join the 12 WEEK AWESOME ARMS PROGRAM to level up your results. For The 12 Week Awesome Arms program, what's next? You’ll be directed to the cart where you’ll begin your investment in building upper body strength and muscle definition. You’ll receive an email with details to access your fully downloadable program from my website. You’ll get immediate access to the entire 12 week program so you can begin your upper body building journey right away. What type of equipment do I need to complete the Awesome Arms workouts? To complete the Awesome Arms workouts you’ll need access to a super band, a few sets of dumbbells, a workout bench and an exercise ball. The time commitment for this program is 3 workouts per week plus stress reducing activities like slow outdoor walks. You can modify the program as you need, but you’ll see best results with strength training 3 times per week. 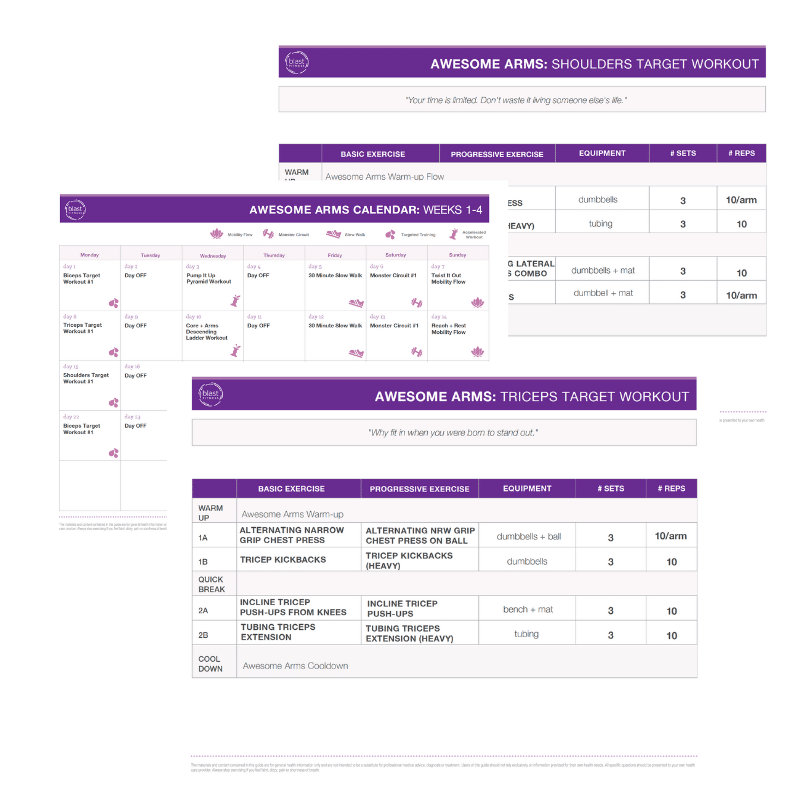 The workouts in the Awesome Arms program are between 20 to 30 minutes in length. I like to run and do cycling classes, will this fit into the Awesome Arms plan? Yes! Many of our members are runners and cyclists. They enjoy the muscle building, injury preventing benefits of our strength workouts. Yes! Many of our members work one on one with a trainer in person or are members of a gym. 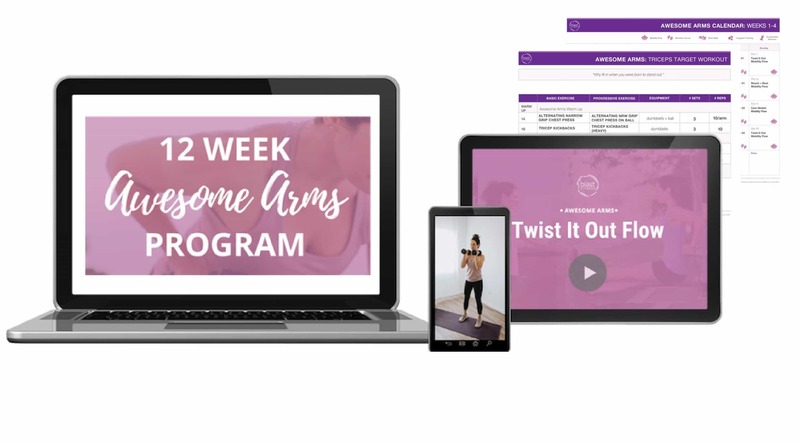 The Awesome Arms program is a great additional benefit to these services as it gives you quick and effective workouts to add to your routine. You’ll have access to workouts for home or the gym to supplement your training. Yes. Many of the women who have completed the Awesome Arms program work out at home with limited equipment. It can be! I highly recommend completing a postpartum recovery series to restore breathing and basic core function and making an appointment with a pelvic floor physiotherapist prior to beginning this program. We have had many mamas complete this program with great success! Send me an email at lana@blastfitness.ca for referrals.